Select the "dial pad" tab and enter a phone number . To delete the input phone number, select . For the first digit, you can enter "+" by selecting "ƒx" for a while. steering wheel or select . You can dial a number from the contact data imported from your cellular phone. The system has one contact for each registered phone. Up to 2500 contacts may be stored in each contact. Choose the desired contact to call from the list. 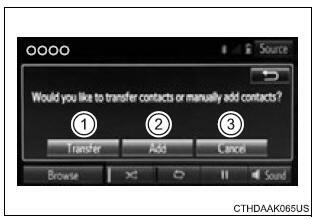 You can transfer the phone numbers in a bluetooth� phone to the system. Operation methods differ between pbap (phone book access profile) compatible and pbap incompatible bluetooth� phones. If the cellular phone does not support either pbap or opp (object push profile) service, you cannot transfer contacts. Press the switch on the steering wheel. If the phonebook is empty, a message will be displayed. Select to transfer new contacts from a cellular phone, select �always� and then enable �automatic transfer�. Select to transfer all the contacts from a connected cellular phone only once. 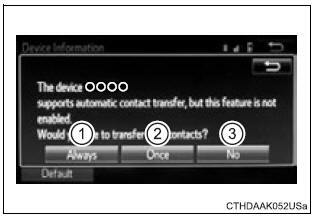 Select to transfer the contacts from the connected cellular phone. Follow the steps in "update contacts from phone" from "step2". Select to add a new contact manually. Follow the steps in "registering a new contact to the contacts list" from "step2". You can make a call using numbers registered in the contact. Select the desired number to make a call. You can make a call using the call history, which has the 3 functions below. Select or the desired entry from the list. Check that the "call" screen is displayed. If you make a call to or receive a call from a number registered in the contact, the name is displayed in the call history. If you make multiple calls to the same number, only the last call made is displayed in the call history. You may not be able to make international calls, depending on the mobile phone in use.